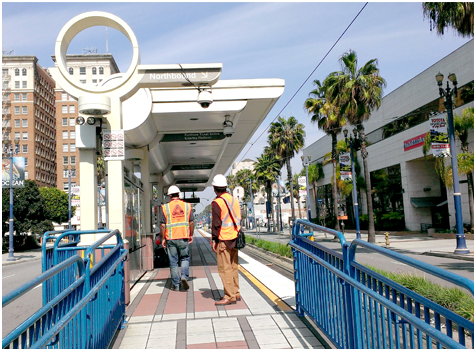 Design/Build team of Amoroso-Owen was contracted by the Los Angeles County Metropolitan Transportation Authority (Metro) for the Metro Blue Line project involving refurbishments of the entire group of 21 Metro Blue Line stations. Owen Group, as a design partner to Amoroso, is providing full design and ADA accessibility/compliance for all the 21 Blue Line stations and rail platforms. These refurbishments will upgrade the 20+ year old stations with a renewed look, as well as sustainable technology. The overall work specified consists of refurbishing the stations that includes 17-new canopy structures at grade stations and rail platforms, repainting, retiling, providing platform vent openings, replacing trash receptacles, adding new benches, replacement of station light fixtures, electrical and communication systems, and the installation of CCTV cameras. Additional scope includes refurbishing ramp entries, street levels below platforms for elevated stations, entrance/exit ramps, removal and reinstallation of existing artwork pieces and other related services. Additionally, Owen is providing site observations and assessments of existing stations with photographs and comprehensive reports, and energy efficiency assessments for sustainable design. A series of training sessions and certifications for rail safety is required for all on-site Team members. This is a fast-track project which will take 24 months of design and construction to complete all 21 stations, which involves construction almost around the clock on fully operating stations.